Alongside the academic awards it provides, the CSC offers individuals the opportunity to pursue career development through the Commonwealth Professional Fellowship scheme. 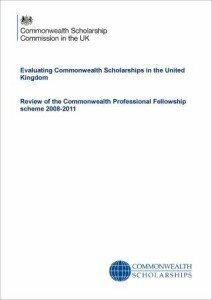 Since its inception in 2002, the scheme has provided a total of 745 awards (as of 2012) to Professional Fellows from across the Commonwealth, with numbers steadily increasing in 2013. The overall aim of this report is to provide an overview of the existing data that is held on the Professional Fellowship scheme, including a survey exercise conducted in 2013 of Professional Fellows who undertook an award between 2008-2011, as well as outlining the new methods and procedures being implemented by the Evaluation team to ensure ongoing consistent data collection. The report also provides first-hand evidence of participant perspectives, through summaries of focus group discussions that were held with both Professional Fellows and host organisations in November and December 2012. The report begins by providing a brief overview of the scheme and the purpose of the review. The next section of the report consists of descriptive data analysis of the Professional Fellowship scheme and basic data relating to the Professional Fellows. The second chapter provides a summary of the focus group discussions held with Professional Fellows, and the third chapter reports on our engagement activities with hosts and employers. Finally, Chapter 4 provides some individual examples of impact and the type of work being undertaken by Professional Fellows on their return home. In conclusion, we note that, although there is scope for greater data collection and more rigorous analysis in due course, we are still able to report that the data currently held clearly demonstrates the positive impacts that Professional Fellowships have on individuals, institutions, and wider society. Chapter 1 – Commonwealth Professional Fellows: who are they and what do they do?